Yes, all the itty bitty green babies are nestled safely in their OMRI certified biodegradable pots, surrounded by lovely organic soil, awaiting tomorrow's feeding of fish emulsion. My neighbors will hate us for the next day or two. The neighborhood cats, however, will be lining up outside the greenhouse. As much as my green babies love fish emulsion, it's the one element in the process that kills me a little bit. It just lingers, no matter how often I shower. It overwhelms my sense of smell, and I think I smell like rotten fish for days. Phew. But that's a task for tomorrow. Today, after I watered the last newly planted tray, I drank a celebratory Diet Coke, grabbed my camera, and took a quick walk around the gardens. for hosting Garden Bloggers' Bloom Day. It forces me to stop for a few moments and enjoy what's happening in the gardens. And—oh my. What a crazy plant party is going on! Edibles! Ornamentals! Medicinals! Oh my! The overwhelming theme, though, is—weeds. Eek! And mulch—needed ASAP! And—where did all of those leaves come from? I vividly remember hauling ten billion leaves out of the beds this fall. Yeesh. 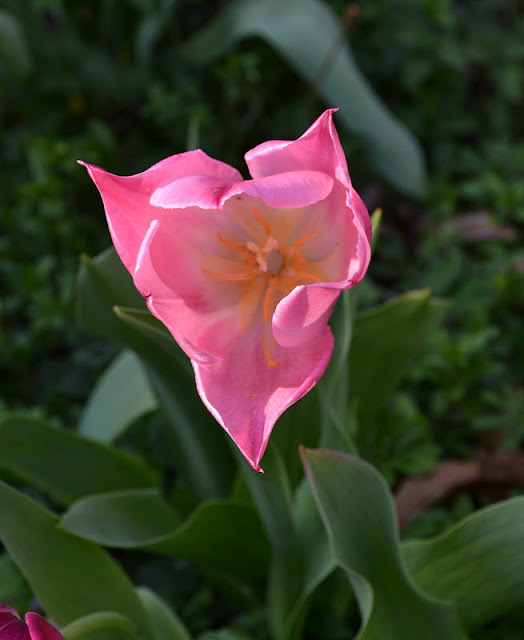 So, if you'd be so kind to overlook the random weeds that crept into the photos, and search carefully under the bed of leaves...you'll find what's blooming and growing in our garden. Daphne. Last Bloom Day, I raved about my neighbor's daphne. Now, I have two pots to call my own. But these Ziva paperwhites were from that order, and they are now gracing the path to the small greenhouse. This is my daughter's birthday tree. We planted it when she was born. She'll be 11 on April 2. Can I tell you, my tomboy, chicken-loving, horse crazy girl had to change outfits, fix her hair, and put on lip gloss before we went to Barnes and Noble last night? I'm dying. I need to stop time and keep her little. 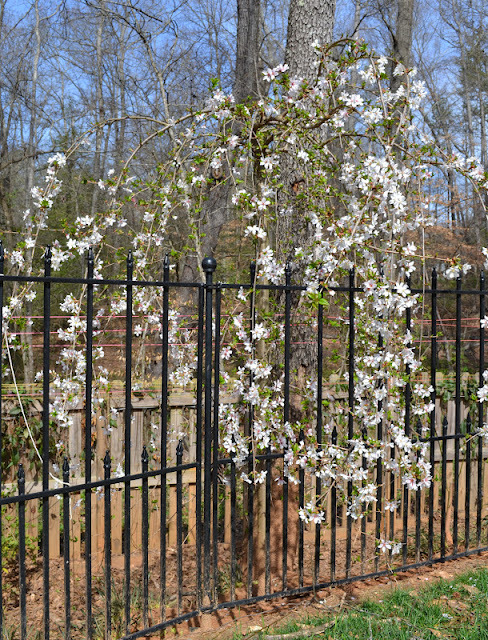 One of my favorite additions to the garden is the weeping cherry. The chickens enjoy it, too. The viburnum is ready to pop. I've never seen it so full of potential blooms. And the forsythia...finally, all of the bushes in the front, back garden and forest are filled with cheerfulness. Even the bushes our pups chewed last year recuperated and are blooming like mad. Nothing announces spring like forsythia blossoms. I even cut some to bring inside this year. The hellebores continue to amaze...more and more keep popping up all over the gardens, which is fabulous because we have so much shade. And--I just discovered a nursery that specializes in amazing hellebores. Don't tell my husband, but I think I need some online retail therapy. Just a few. Not 1,200. This camellia makes me think of brides...lovely, blushing brides. Or sweet, itty bitty baby girls who don't care about lip gloss. Crazy--even the coreopsis is blooming. 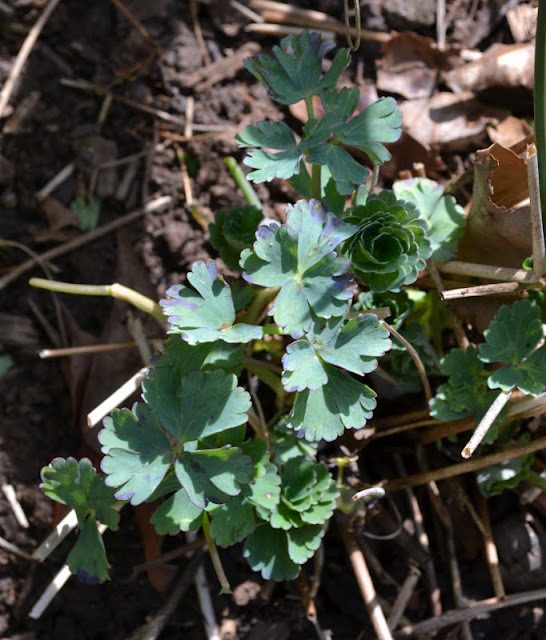 My favorite perennial is peeking out from the leaves. Truly, is there anything as gorgeous as a bleeding heart? ...and the creeping phlox popped a few blooms. 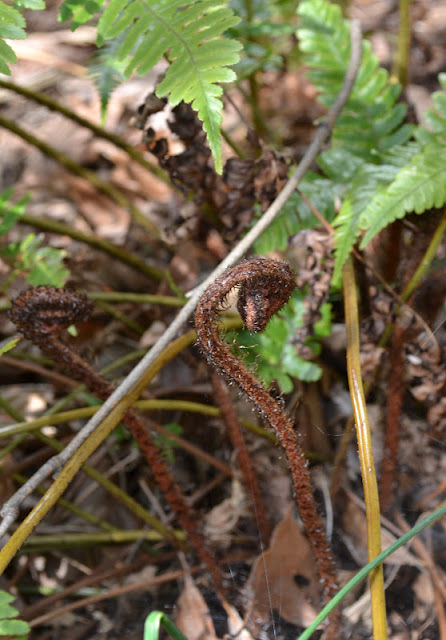 Ferns fill our shady gardens, and I adore watching the fiddleheads emerge. Woodland violets...scattered throughout the forest. Pieris Japonica...which I used to abhor and now adore. 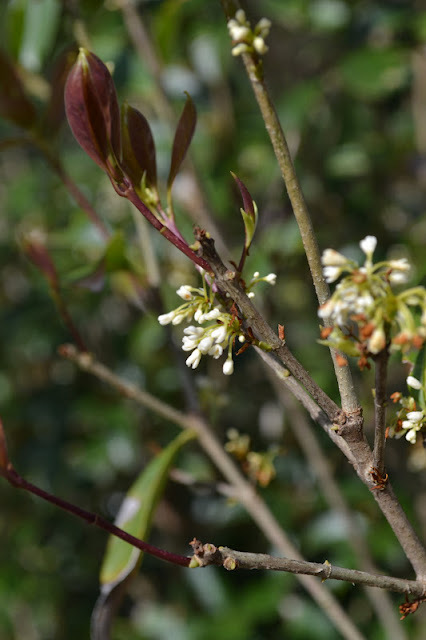 The blooms are darling and the leaves are lovely on their own. In my opinion, most edibles are as gorgeous as any ornamental--with the added value of deliciousness! 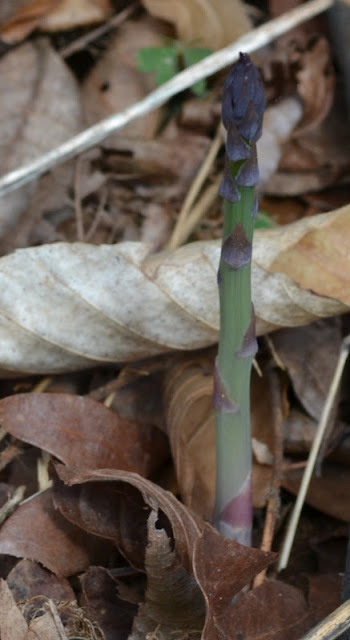 "This is the dawning of the Age of Asparagus, the Age of Asparagus..."
Divine Fraise des Bois! We'll never have a pie from them, but they are the most scrumptious treat imaginable. I've planted them in containers, in the forest, as borders...they are beautiful, evergreen, and mouthwatering. Swiss Chard is still going strong...and is about to become a frittata tomorrow. This year, I'm growing eight varieties of garlic, plus shallots and onions, in grow bags and containers. So far, the results look promising. I am, of course, in dire need of getting the big garden and potager cleaned up and planted. You know what they say about the shoemaker's children? Well, that's the same as the trials of the nursery owner's gardens. I'm honestly in awe of this little raised bed that I planted to showcase medicinal herbs. Now, I'm not an herbalist, but I do have herbalists who request that I grow specific plants for them. I'm fascinated by the history of herbal cures. In fact, I attended an organic growers' workshop this past weekend, with a tract dedicated to medicinal herb usage. 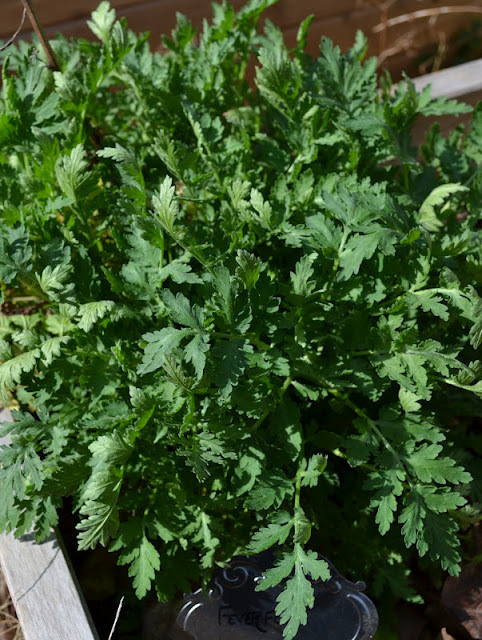 I was so excited to learn about how to use mugwort and tansy, wormwood and clary sage. 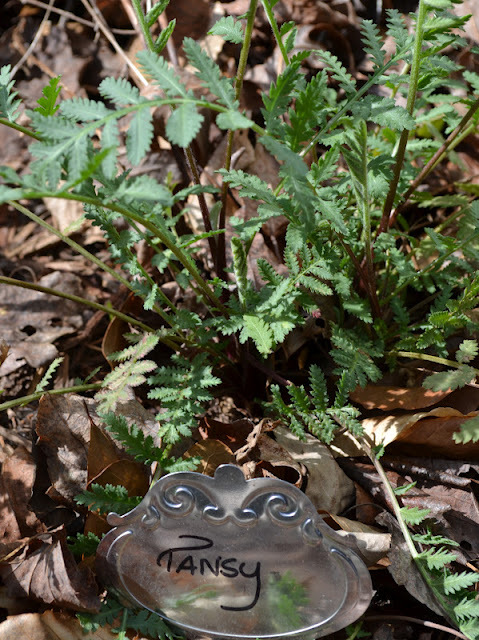 Tansy Still, I have a shelf of books devoted to herbs, so I'm going to keep reading and learning. Will I ever treat my kids with an herbal concoction I brew in the kitchen? But I think I'm brave enough to make lemon balm tea. 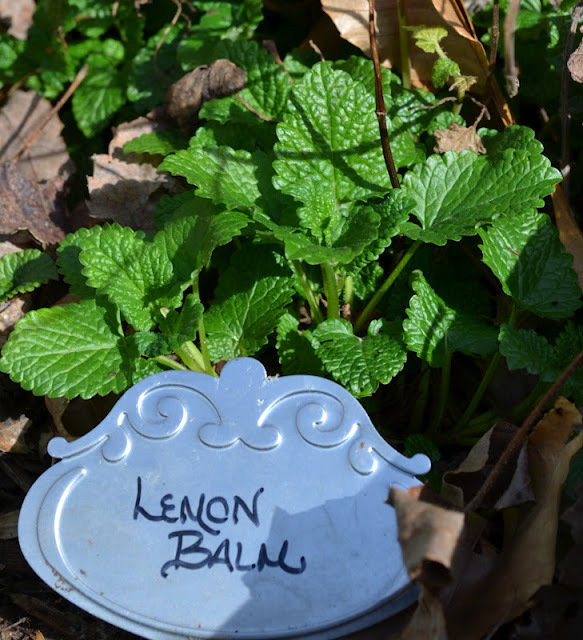 Just brushing the dead leaves away from the lemon balm left the most delicious fragrance on my fingers. Thank you, May Dreams Gardens, for reminding me to get outside and enjoy the blooms. 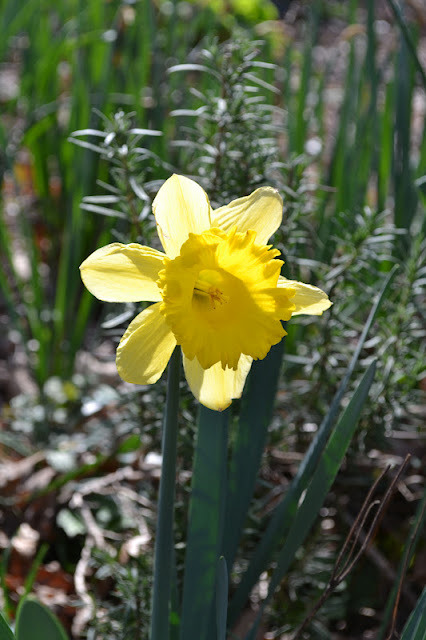 I'm looking forward to virtually visiting the other garden bloggers' spring gardens!